On a brisk January evening, I made my way through Roppongi’s lesser traveled streets to find what can only be described as a cozy neighborhood eatery not out of place on the streets of Milan or Rome. This encounter was not by chance though, on a recommendation from a seasoned Italian expat friend, who said with a wink “Carne Fantastico” I decided to come and see for myself. We were greeted with a bright ‘Buona Serra- konbanwa’ as we entered, and although it was still a pretty early 6 pm, the restaurant was already bristling with customers. 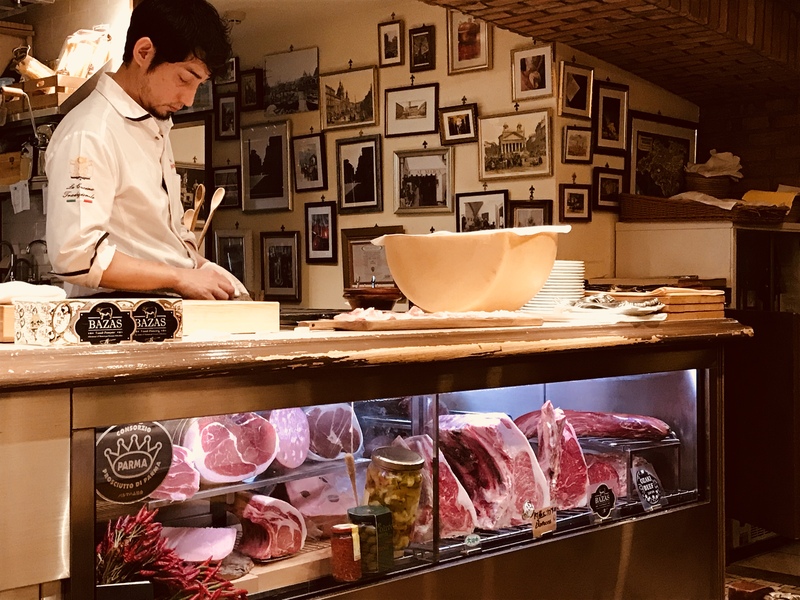 We were shown to a seat right next to the kitchen with a view of what can only be described as the ‘Meat station’ were in a glass case we could see choice cuts from not only Italy but also from France, New Zealand as well as several locations in Japan. Our waiter, came to our table with a trolley of fresh ingredients and explained to us that the vegetables had been imported that day- from Italy no less, along with some Japanese prawns and mussels. For starters, we decided to ask for ‘Omakase’ or some recommended dishes and we were not disappointed. We started with a Caprese salad, with fresh prawns and snapper, and just the right amount of olive oil, salt, and chive - it was light and delicious. Next came shaved Brochuto with fresh figs, the combination of sweet and savory was perfect and set us up for the artichoke served chopped, with generous shavings of parmesan cheese. This had a strong and interesting taste- something like kale but stronger and was nicely balanced with the parmesan saltiness. The fundamental of any Italian meal must be the pasta and risotto, The Linguine was very good, the homemade pasta was thick and full flavored with plenty of mussels in a butter and olive oil based sauce, dressed in dill. Straight away we could smell the woody smoked charcoal off the large 300g char-grilled sirloin steak "Ohnuma" served on a cutting board and garnished with thyme, the meat came without a sauce, just some rock salt with a side of potato wedges and salad. The Kumamoto beef we chose was certainly full-flavored, juicy, lean and barbecued to perfection. A feature of the restaurant is they butcher the cuts right there and then, and I must say it was one of the finest steaks I have had in Japan. We finished off the meal with some espresso’s, unable to contemplate dessert, but if that is your thing there was some classics such as Tiramisu, Gelato (from Milan no less) and traditional Italian tarts. We will definitely be back for more.